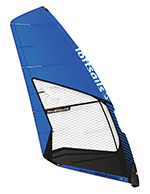 The WaveScape is Loftsails manoeuvre-oriented four batten wave sail and the choice of team rider Diony Guadagnino. Refined for 2018 with slightly shorter boom lengths, it is the only 5.0m on test here that is recommended for use on a 370cm mast. Available in either orange or blue, it is visually very clean and eye-catching and has the usual excellent attention to detail we’ve come to expect from Loftsails. Heavy-duty 5mil triax scrim in the luff and foot panels; their unique and super durable luff sleeve construction and Standing Battens in key areas to promote range and stability – it is easy to believe the WaveScape is thought out by a designer still very much active in our sport. Simple touches such as the extended Velcro opening of the tack fairing (a long-standing feature on Loftsails products), the inclusion of the batten-key in the fairing and the orientation of the tack’s roller pulley for reduced friction, all add to the product’s sense of quality. Rigged on a Team Edition 100% RDM mast, the usual issue in going down a mast size is that the sail feels too spongy and unresponsive in marginal winds. Well, this 2018 WaveScape has blown that assumption right out of the park! It sets with lots of luff curve (the most in the group), zero rotation in the bottom two battens and only a moderate amount of shape low down in the draft, whilst there is relatively little looseness in the leech. Yet, despite its somewhat uninspiring appearance at rest, it was a marvel in the light stuff. How looks can be deceiving! When the wind fills, the extra play in the luff sleeve enables the WaveScape to adopt a much fuller profile. Once it’s breathed and stretched into shape, the high skin tension and taut panels of the sail all seem to generate power, its long boom ensuring plenty of useable feedback through the backhand. There is even plenty of response given for pumping – the softer mast flexing and springing back under good technique to help punch the board clear. Once going the WaveScape feels incredibly compact and controllable in the hands – a real feat considering it has some of the larger increments amongst the group. 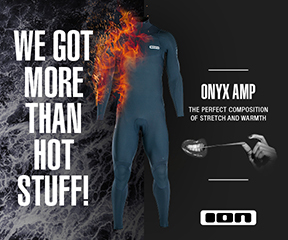 Fast and responsive, it can be used to blast around any coastal break in comfort, relying on its natural ability to twist instead of the usual convention of looseness in the leech. As the conditions become more severe, the WaveScape can be retuned with extra tension, although use of the lower clew eyelet seemed to safeguard the manners of the sail well. Providing ample feedback and drive through the backhand during transition, the WaveScape goes light as it is eased out, affording the sailor the time and energy to reposition their stance and kit. The longer boom does mean the WaveScape takes longer to rotate in transition, but the difference is only noticeable if you look for it, and is a small sacrifice to pay given the performance provided. 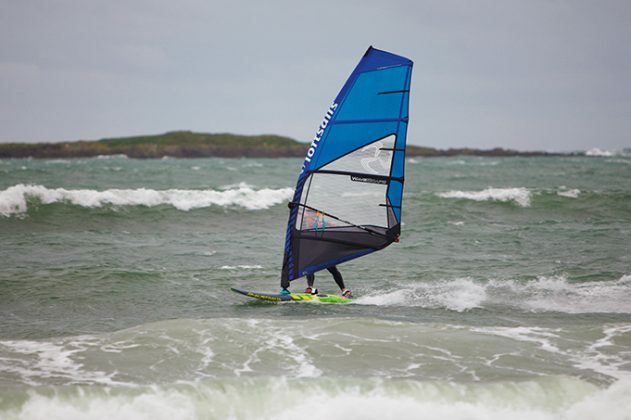 Uniquely using a 370cm mast, the WaveScape somehow benefits from all the upsides, such as light handling and riding comfort (not to mention the practical possibility of having just one mast), without compromising its marginal wind range. It is certainly the surprise of the group for 2018.